I just purchased your Christmas Countdown app. Why don’t you have the TOTAL days till Christmas? I don’t need to know the countdown days till Christmas from December 1 to December 25. Jeez! Please fix this! I need to know how many days I have to get things done in the months before Christmas. A badge icon with the number of days counting down, like all the other countdown apps have, would be great. This is the best Christmas Countdown app in the App Store! Thank you for the iPhone X screen support & the new Breaths countdown! One feature I would like changed is to have the countdown restart the day after Christmas instead on New Years Day. The app is cool and I really enjoy the choice of different music. Honestly, I had the free app and it was excellent. When I bought this one, I tried to change the song and it crashed. Never in a million years will I buy any of your apps unless you give me a refund or fix the app. For all of you app-buyers, I'm glad you read this. I'm only giving it 5 stars so it shows up. Please mark this as useful so more can be educated about my mistakes so nobody else makes them. 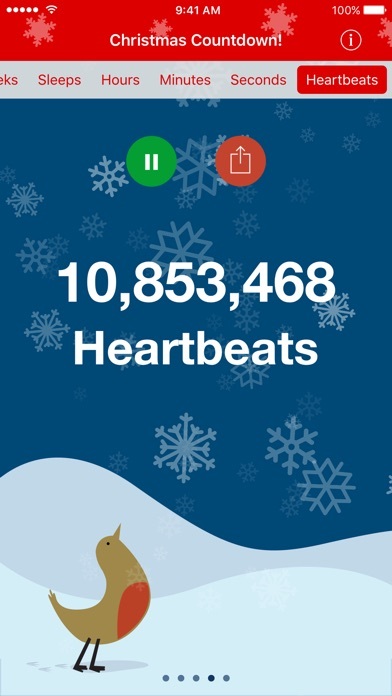 The other free app has more customization and shows heartbeats etc. can't believe I just bought this. thus game isms beast u can even know how many seconds till Christmas and hours and minutes and days and nights it BEASTLY....... things I gotta say is I LOVE IT!!!!!!!!!!!!!!!!!!!:):):):):)!!!!!!! I love this app!!!! I would highly recommend it!!!!! this app is so cool! it's easy to scroll through the different options to see all the different kinds of ways to countdown to Christmas. I really reccomend this because there is music and you can pick through different characters like bird, snowman, reindeer, santa, etc. I bought this app to fix all the bugs but it didnt! I sent an email to get my refund because I like the other app better. Highly accurate for anyone who is curious about the epic finale of the winter season! This app isnt very good. The options and the music and how you can look at the time differently is amazing! But there are a few problems. You can't post anything to facebook, and the time is wrong. Hopefully this app will me updated and fixed. I relied on this app to tell me the time until Christmas for almost 3 years now. I have always greatly enjoyed using it. However, this morning I compared its information with that of a Christmas tree maker app that I also have, and found that they showed a different number of days until Christmas. 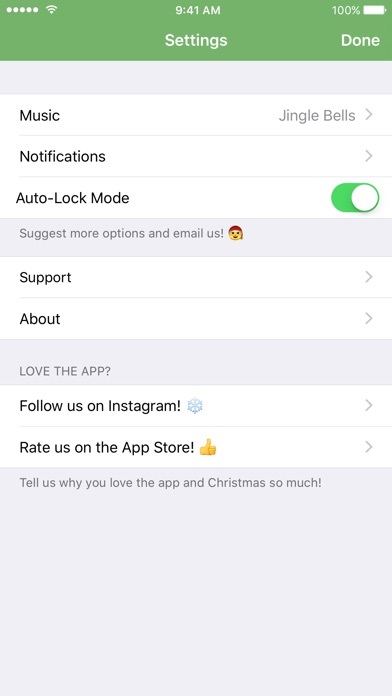 Now, in previous years I have notice that this other app uses the number of nights until Christmas although it says days, so it is always the same as the nights section of this app. But today they were off by a day. I took a look at my calendar to try to get to the bottom of this, and found that the other app had the correct number, and this app was wrong. This is an unacceptable error, and I expected better of this app that I have always deemed high quality. I deleted and redownloaded the app, but the error still persisted. I hope that this error will be corrected soon. Fix the post to Facebook !!! First year the post to Facebook does not work!! FIX IT!!! It could be better. App needs to be updated to the iPhone 5. Waste of 99 cents ! Option to post to Facebook doesn't work !! This was why I got this app. 2 thumbs down ! I found this app to do exactly what i wanted! This app crashes whenever it is opened since I updated to iOS 12 on my iPhone xs. The app prior to this would have been 5 stars. Please release an update to fix this as is incompatible. I love the app but it will not let me post to Facebook. Would like more tunes to choose from, and more backgrounds. Most disappointing though is that it won't let me post the countdown on Facebook. I get an error. Would be great if you had different backgrounds. Only one!?! Rip off! Ong omg yes I love this app! This was a waste of Money!!!!! Fix the Post to Facebook!!!!!!!!!!!!!!!!!!!!!! Not sure if my phone is just not working but I can’t hear the music that should be playing...?? ?